The word Denture is a term commonly used instead of Dental prosthesis. It represents the artificial replacement of a missing or lost tooth. It can be a fixed prosthesis (which is more commonly referred to as dental bridge )that is cemented on your teeth and cannot be removed , or removable prosthesis , which can be removed at the patient’s will . The Term “Denture”, however, is almost always used to express the removable prosthesis type. What Are Dentures Made of ? Partial Dentures: Which replace only the few missing teeth that you don’t have in your mouth. According to material, they can be made either of acrylic resin (or plastic), cobalt chromium alloy (or metal), or a mixture of both. Why Choose Dentures over fixed replacements like implants ? In some cases, implants cannot be done, either due to heavy bone loss or a medical condition that prevents successful implant placement. In addition, the increasing costs of implants nowadays have directed most patients to dentures, which are much cheaper and easier and don’t involve any surgery. Do I need to take special care of the denture? A denture is an extension of your mouth. Most people think that since they are artificial, they don’t need care. This cannot be further from the truth. Dentures are a major cause of problems if you don’t take care of them. 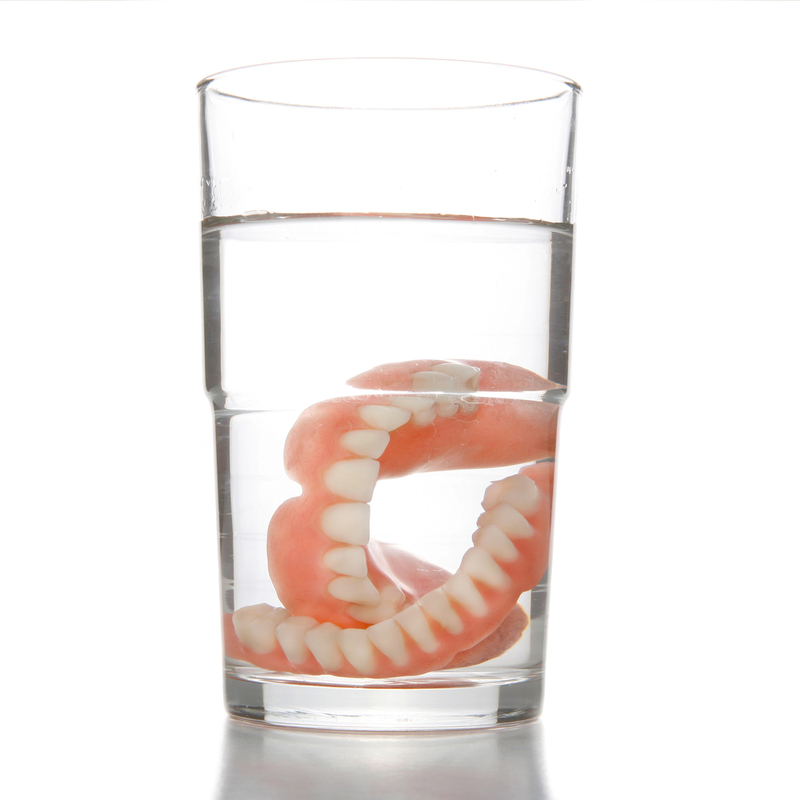 What are the most common denture problems? Inflammation of the mouth and gums. Breakage and fracture of the denture. Roughness of the denture borders. How do I take care of the denture? The first step of taking care of the denture is taking care of your mouth. If it is a complete denture, the mouth should be thoroughly cleaned after each meal and the use of mouth-wash is recommended, but if it is a partial denture, the remaining teeth must be kept in outstanding condition so that they can support the denture and not be affected by decay or gum disease since partial dentures tend to entrap food. Taking care of the denture itself is no less important. Most dentists would recommend a Brush-Soak-Brush or BSB technique. The dentures’ teeth should be brushed as if they are natural, toothpaste and all. The denture should then be soaked either in chlorhexidine (or Mouth-wash) if it’s a metal denture, or in hypochlorite (or bleach) if it’s an acrylic denture. After soaking the brushing process is repeated again. Care of the denture also includes caring for it outside the mouth. Any removable prosthesis will be removed at some point in time. After removal, the denture should be handled carefully to avoid being dropped or broken. Most people who suffer from Parkinson’s or any other condition that affects dexterity and finger skills should ask their nurses or homecare providers to handle the dentures for them. The denture should be also kept in a clean container, which is solid enough to protect it until the patient decides to wear it again. Regular dental visits are also of the utmost importance. If the denture is loose, painful or just uncomfortable, you should head directly to your dentist. They possess the proper knowledge and skills to figure out what’s wrong with them and fix them before major complications arise. As you can see, the importance of taking care of your denture cannot be overstated. Denture care should be implemented daily and become a part of your daily routine.With proper care, your dentures could last up to 10 years and may be more with only minor modifications, and become very comfortable to use and a regular part of your daily life.